When I arrived at the fair last Friday the rapidly growing crowds were as a naturalist might say, as thick as ants at a picnic. 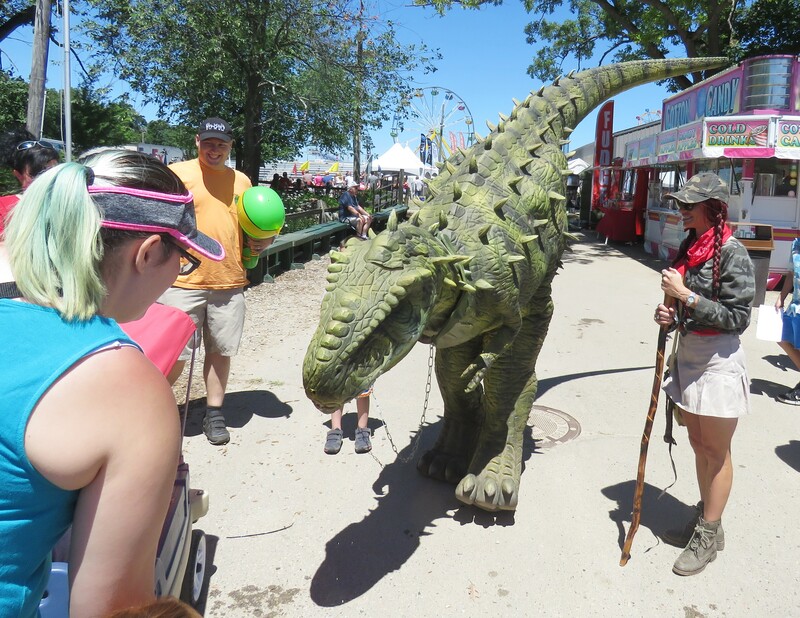 After entering the fair grounds and walking past the Ellis Barn and an assortment of vendors hawking their wares, I was greeted by a friendly eight-foot-tall green dinosaur on a leash. Pig races were getting started and folks gathered in the Miracle of Life Birthing Barn to see what animal would emerge next. The metallic sounding din of carnival rides coupled with loud excited voices drowned out any sounds of nature that might be expected in a large county park. There were no bird songs or leaves rustling in the wind, no song of katydids or even a soothing buzz of hummingbirds. All of that changed quickly when I decided to take a break from the fair activities and search out a short, hard to find, primitive trail on the east side of the park; the least developed area of Springfield Oaks. With the assistance of Oakland County Parks staff, we located the hidden trailhead. The north end of the trail is at the edge of the woods just a few hundred feet south of the equestrian practice arena and east of all fair activities. If you were to look back as you entered the park, the Oakland County Parks water tower would be on the hill behind you and a bit to the west. This map will help you find it. As I started to hike down the natural surface of the unnamed trail, the duel between the sounds of nature and the sounds of people at the fair took a turn. Nature quickly gained the upper hand as she often does when given half a chance. The trail terrain meandered beneath very gently rolling hills, a gift of the last glacial retreat. The west side of the trail was heavily wooded while the east side embraced the edge of a wetland. Mature oaks and hickory dominate the landscape and muffled almost all the sounds of the fair. The words of Goodall returned to me when I sat on moss covered glacial erratic to take in the scenery. “Wherever I go, I see little bits of nature, little bits of animal behavior. And nobody else is watching…” and much to my surprise no one else was walking the trail, let alone watching the ways of nature unfold on that blue-sky summer day. I walked slowly for a few minutes until the trail split and then I opted to follow the loop that first went north. Before making a 180 turn and headed south along the wetland. Suddenly, I was not hiking alone, I smiled and discovered what could only be called the wilder side of Springfield Oaks. Chipmunks, deer, chickadees, and other small winged creatures were keeping me company. Meadowhawk dragonflies begin to cruise the airways of Oakland County in the sultry days of July; the hike brought my first encounter. 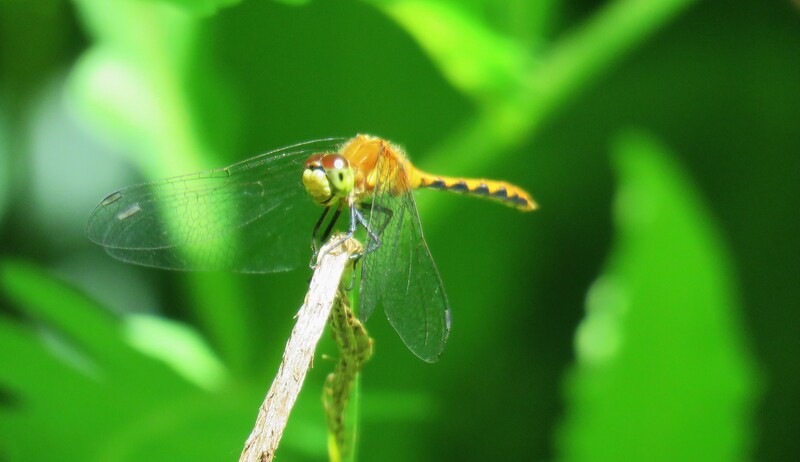 Taxonomically, they are found in the order Odonata (dragonflies and damselflies), but most novice dragonfly observers, myself included, conclude they are really hard to identify as to which species of meadowhawk. With a bit of help from friends, I narrowed down the meadowhawk I encountered perched on a stick to be the “Orange Meadowhawk” (in the genus Sympetrum). A boldly colored beauty with the appearance of a smiling face that is usually found near wetlands. The name meadowhawk is a reference to its skillful predatory behavior when it flies inland from the wetlands to the meadows where it hunts mosquitoes, flies, and other tiny meaty morsels. As I kept walking, the sounds of the fair drifted away and the ways of nature continued to unfold. 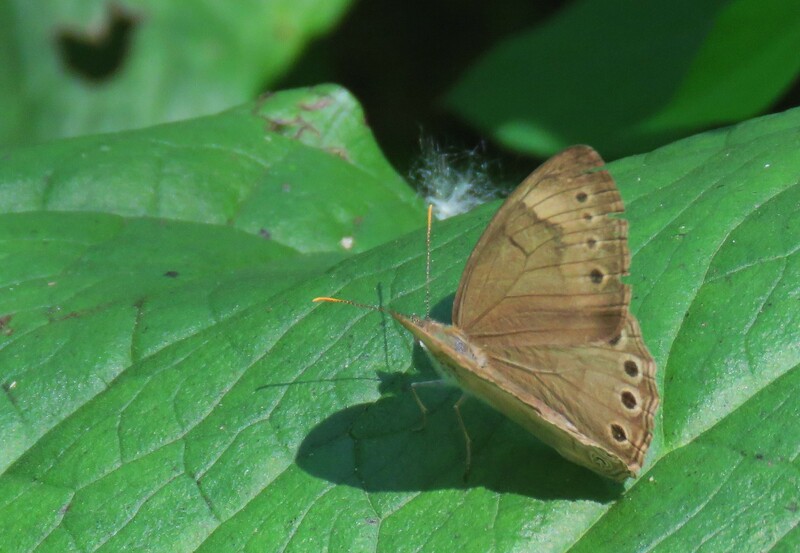 An Eyed Brown Butterfly (Satyrodes eurydice) rested on a very large leaf of a skunk cabbage. The Eyed Brown Butterfly is fond of wet meadows and is often seen flying “lazily” (in human terms) through tall grasses or near wetlands. This one remained motionless except for an occasional wing flap making it easy to photograph. Gusts of wind stirred the forest leaves just as I came upon a patch of mayapples. Mayapples thrive in the park’s fertile forest soil under the dappled sunlight and are easily recognizable by their large deeply cut leaves. Even their shadows showed the deep cuts! I looked under the leaves of one trail side cluster of mayapples and spotted a few of the fruits that replaced the white flowers that bloomed in May. 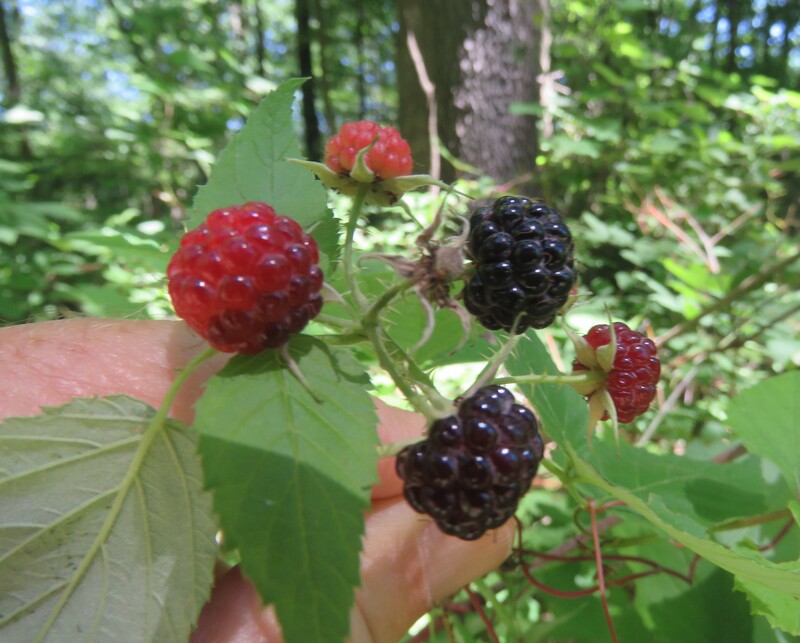 A bird song and flurry of wings drew my attention to a patch of wild black raspberries that had ripened in the sunlight near a gravel road before turning around and heading north again. I foraged with the birds and enjoyed a finger-staining mouthful of ripe berries. 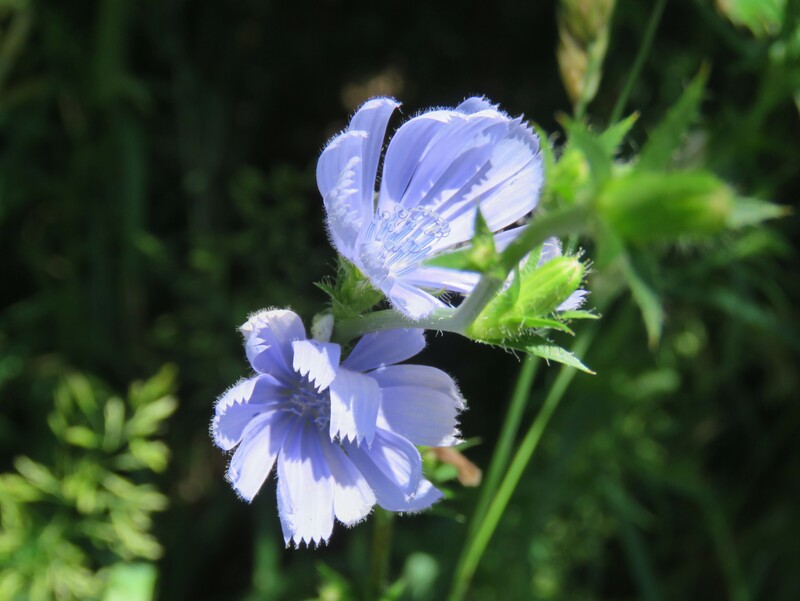 Chicory, a native plant of Europe, struggled to bloom at my shaded turn around point while just yards away their tall stalks in full sunlight were rich with their pale blue blossoms. I look at chicory as one of my favorite naturalized “wild citizens” of our Oakland County plant world. Their young leaves can be consumed as a steamed vegetable or raw salad. Their roots, when roasted and ground are an “OK” substitute for coffee; I have tried this on camping trips with some success. From there it was back to the bustling world of the fair after fully enjoying my peaceful trail side exploration. 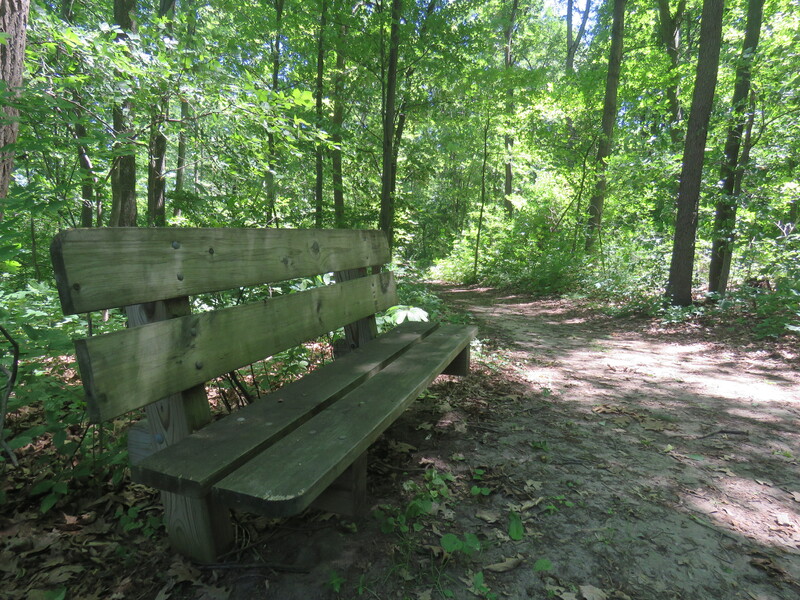 If you visit the Oakland County Fair on this closing weekend consider a quiet exploration on the wilder side of Springfield Oaks, even if nobody else is watching.